In 2009, members of the CCA NH Board became aware of the dramatic decrease in Great Bay oyster beds. In 1993, there was an estimated 1100 acres of healthy oyster beds. Parasites exacted a heavy toll and reduced the acreage, almost overnight, to just 100 acres. The Oyster Shell Recycling trailer. After researching the issue with UNH and The Nature Conservancy (TNC), CCA NH secured funds from the Orvis Company, of Manchester, VT., to start a shell recycling program with area restaurants. Oyster shells are the preferred substrate for baby oysters. Two goals would be met—acquire shell to re-establish the disappearing beds, andincrease public awareness of the problems facing the Great Bay estuary: siltation, storm water run-off, point and non-point pollution, the disappearance of eelgrass, disease, and nitrogen loading. Oysters are amazing filter feeders. On average a single adult oyster can filter 20-50 gallons of water a day. One estimate calculates that the healthy beds in the early 1990’s could filter the entire bay in 3-4 days. The remnant beds of today take well over a year to perform the same function. A representation of the amazing filtration powers of oysters. The roll off container supplied by Harding Metals. 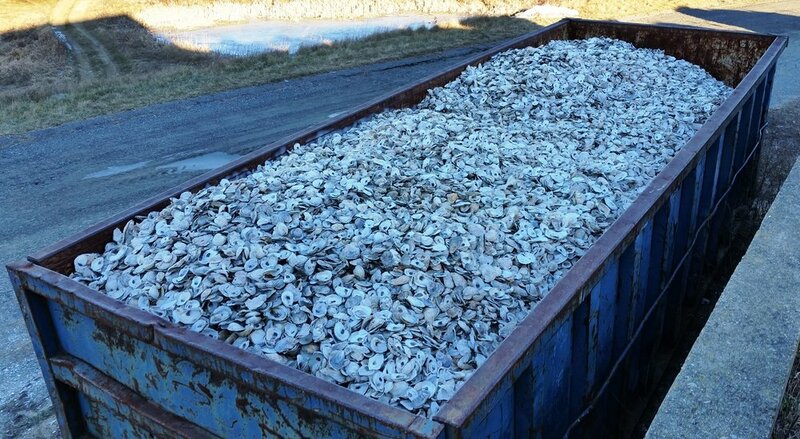 Weekly pick-ups of shell have continued every Wednesday for seven years with over 7000 bushels of shell being delivered to both The Nature Conservancy and Dr. Ray Grizzle at UNH for placement back in Great Bay every year. The process has evolved over time. Where shells were once stored and dried in bags, they are now deposited into in 30 yard roll-off containers supplied by Harding Metals of Northwood, NH. Oyster shell is deposited back into Great Bay. Once seasoned, shell is then moved to a Piscataqua River location for transfer to a barge before going to a site in Great Bay. An onboard crane is used to place the shell in a permitted site that is off-limits to recreational harvest. About two dozen acres have been created to date. Some shell is provided to TNC’s Oyster Conservationist Program where homeowners around the bay raise baby oysters to larger sizes that eventually end up on top of newly created reefs. Over 80 homeowners now participate. The Oyster Shell Recycling Program continues to meet the two primary goals—a supply of shell and public awareness. But, it has only succeeded because of the volunteers who have given time, the businesses who see the value, and the donors who have provided funds. CCA NH is grateful to all! If you are a restaurant that would like to participate, an entity that would like to donate, or someone who would like to volunteer, contact David Beattie at bflytide@comcast.net for more information. Become a CCA NH member.